It made me consider the question in a way I hadn’t before – and here’s the response: three sci-fi-ish narratively-useful ideas grounded in reality, about what print news could look like in the World Of Tomorrow. Berg has just announced a mini in-your-house printer magic box cloud news thing. This is actual wizardry. The evolution of devices like that is basically a personal printed news sheet that you grab on the way out of the door, read on the commute and recycle at the office. Or that greets you with the day’s news in print when you arrive home, or gives you a non-screen thing to read with breakfast so it doesn’t matter if you spray ketchup on it. And it weaves personal/social news stuff in with “proper” news sources. It’s unbundled in a very cool way. The newspaper that carries your birth date, or announces your marriage – the one you appear in – is a thing people still want to keep. There will be more cut-out-and-keep, more souvenir editions, and quality of production will go up along with prices, until each paper is a beautiful object in its own right. Something along the lines of some of the really innovative papers at the moment – the prettier ones here are starting to move in that direction – or McSweeney’s San Francisco Panorama. 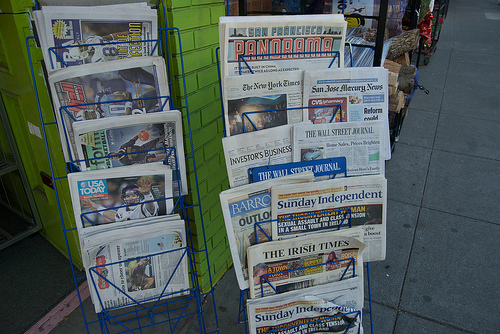 At its most extreme, this could end up with weekly papers being more like glossy magazines – something to sit on your coffee table for days at a time, something you can dip in and out of during the week, carrying good long reads and beautiful pictures – the sorts of lean-back things you can really do well in print. This might be the least likely of the three to come in, because even though the infrastructure is already there, the folks in charge of newspapers want to stay mass-market as long as possible so won’t make the design investments to switch to niche. And it’s questionable whether the business model would actually pan out, given distribution costs. People will still read something if it’s handed to them when they’ve nothing else to do. Metro and Evening Standard will still do well, in London at least, as long as there are captive commuters – though when wifi is installed on the Tube that’ll be very disruptive to their businesses and they’ll have to up their game to compete. Free sheets, supported by ads, won’t go away until/unless the last of the display ad business dies. If free papers can come up with a better way of tracking who actually reads them and what they do, and sell that model to advertisers, then free sheets could end up being the most profitable of any medium. So depending on how near, innovative and prosperous the near-future is, it might be worth thinking about offline tracking in your newspapers – RFID trackers that would let companies see how far their papers travel and how many times they’re read, or giveaway cards that would unlock something extra (rewards online, possibly, or free coffee/pasty/Twix offers) in return for a name/date of birth/postcode. What did I miss? I didn’t say local, because I don’t think many local papers will exist in 30 years’ time in forms other than those above. That’s not to say local news won’t – in fact, it’s likely to be much stronger than it is now, thanks to better local networks, horizontal vectors for information to spread, facilitated by but not limited to the internet. Will any news organisations run print papers as loss leaders, for prestige or for other purposes? Or will there be any profitable newspapers that aren’t also artefacts?